Dolls, to the left you will find J Brand’s luscious Low Rise Shorts in Bright Red; to the right direct your attention to Topshop’s tantalizing Moto Pink Denim Hot Pants. Though the Topshop stunners sport a slightly different shade than the blissful J Brand’s; for just $55.00, in comparison to the $159.00 required to add a pair of the original Low Rise Cutoff Shorts to your summer wardrobe, they are le perfect compromise for the girl looking to indulge in the colored denim trend – on a budget! Tell me, kittens…will you be a big spender and go for J Brand, or be thrifty and spring for Topshop? Thanks to J Brand and Topshop for the pictures. Don't forget to enter the Tantalizingly Tinted Giveaway for your chance to win a bottle of Mineral Illuminating Tint BODY from Youngblood. Wow..its amazing how much they are asking for either of these cut-offs. I think I better check my closet first. How cool. Glad there's a cheaper version. I'm not a shorts girl so neither for me! I definitely don't like the thought of paying $159 for a pair of shorts, so I'll go with the cheaper ones! They are really cute, great find Erika! 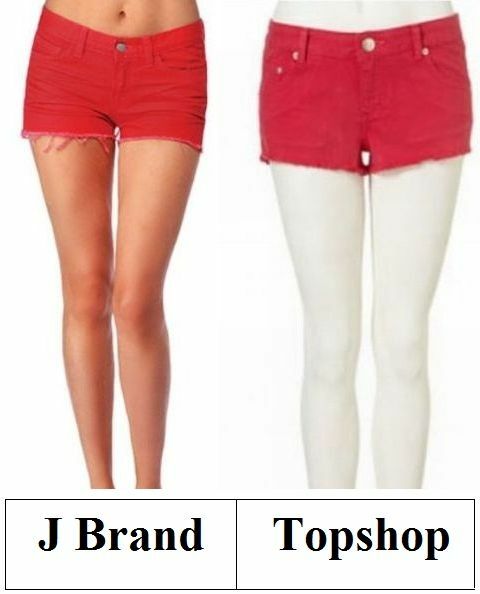 Red shorts are so cute; I'd go for the Topshop ones! When it comes to this type of shorts, a flattering cut is really important so I think I would opt for J Brand if I could afford them! I'll be a spender this time.... I love J Brand, their fit is perfect and that red is fantastic. I'd take the J.Brand. Yay to summer shorts. topshop of course, the price is so much better. Okay, I am really really cheap because I would have a hard time spending $60 on jeans, let alone jean shorts. Haha... oh dear. Oh what??? That is a steal! And I love the color! top shop all the WAY! TT's Attic - Edgy, Affordable Fashion for a Cause! I'm going with the topshop! I love shorts, they're both super cute!!! lovelyy- the colors are fantastic! Wow, these shorts are gorgeous! I fell for them. Love these! They'd both be so perfect for summer. I'm definitely going to be thrifty and go with the Topshop shorts! i must have these! def the thrifty one would be my choice. man i've been MIA in the blogsphere. miss it! catching up on your posts now. Very inspiring. But I wouldn't spend that much on either. Still, this gives me lots of ideas. Very interesting, indeed. It would be hard to choose. What a fab match -- I love the color! The two shades definitely look almost identical. I love this style...I'll go ahead and be thrifty and go topshop on this one! I am kind of loving J.Brands colored denim line. I have been coveting the red jeans but I think I will have to take the red shorts instead! The shorts are so cute. Perfect for a festival. I'll definitely go for the Topshop ones. I just realized I don't have nearly enough red clothing. I'll definitely think about buying the cheaper version. i can't believe those shorts are $160! totally a tightwad tuesday for me today. Totally Topshop, and adoring this comparison!! Well, nice. They really do look similar. The J Brand's hue sucked me in! Ooh, that's tough, since I love both of those brands! I guess I'd have to go with J Brand, though. Ooh In think I might have to check this out... Fab find! Aren't you a life saver? I've been wondering lately where I can find a pair of red hot pants or denim cutoffs that don't break the bank... guess I just got my answer! Thanks a bunch doll!!!! Topshop for sure! amazing post - it's so nice to see such a good comparison! I would totally go for the topshop! Love TopShop but those J Brands look so much better! I am usually more of a high-waisted shorts girl, but that color and Top Shop? Yes please! I love the color of the expensive ones. But I agree with "Lucy and Sarah". 50$ for the cheaper version ain't cheap either. Love them, but would gladly shop my own closet first. Love them both but I would definitely buy the Topshop ones..
*Is 4ever21 your fav shop? *A Fbker calls herself Breakfast at Tiffany's! I*'m not familiar with that EJohn tune. *Too often people don't know the real them! -And this week I'm up to my neck in laziness, haha!